Along with the Panasonic Lumix DC-G95 (B&H/ Adorama), Panasonic also announced the new Panasonic Lumix G Vario 14-140mm F3.5-5.6 II ASPH Power OIS lens. It is a minor update to the original version, with the only change being the addition of some degree of weather-sealing. This new lens costs $597.99, first available for Pre-Order at B&H/ Adorama. 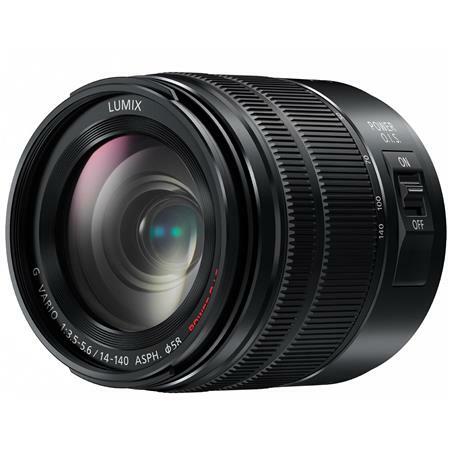 Designed for Micro Four Thirds mirrorless cameras, this lens provides a 28-280mm equivalent focal length range to cover wide-angle to telephoto perspectives. Three aspherical elements and two extra-low dispersion elements combine to minimize spherical and chromatic aberrations, as well as distortion, throughout the zoom range for increased clarity and sharpness. Multi-coated elements help to suppress lens flare and ghosting for greater contrast and color accuracy. POWER O.I.S. compensates for camera shake in order to realize sharper photos and videos when shooting handheld. Stepping motor provides smooth and near-silent autofocus that pairs with an inner focusing design for quick performance. The AF system is also compatible with Lumix cameras’ high-speed contrast-detection systems for focusing speeds up to 240 fps. Splash and dust-resistant design benefits working in inclement weather conditions. This entry was posted in Panasonic lens and tagged Panasonic lens rumors, Panasonic Lumix G Vario 14-140mm F3.5-5.6 II ASPH Power OIS on April 6, 2019 by admin.